What did we learn from the Belgian Grand Prix? After watching one of the most exciting endings to a GP in years and dreaming up headlines such as “Lucky Lewis” I came down to breakfast to find that the FIA stewards had acted out another of their decrees of deity and awarded the race to Massa! What a travesty! Much will have been written in other publications before you read mine, but the case hangs on whether Lewis Hamilton benefited by cutting a corner on the penultimate lap, and thereby gained an advantage to pass Raikkonen. Did he? He definitely did not. For the benefit of the faceless, visually challenged men in the stewards’ box, Hamilton ranged up on Raikkonen’s left as they approached the hairpin. They touched. Hamilton went across the grass and rejoined the track with his nose marginally in front of Raikkonen. All drivers know they are not allowed to benefit from corner cutting, so Hamilton slowed (McLaren’s data logger showed that Hamilton was 6 kph slower than Raikkonen at that point) and allowed Raikkonen to pas him. Hamilton then changed position on the track to slip around the rear of Raikkonen’s Ferrari and then ranged up on Raikkonen’s right and outbraked him for the next corner to take the lead. The ‘no advantage’ rule had been adhered to in all respects. However, the ‘use your common sense rule’ was yet again ignored by the stewards. So here we have yet another (brilliant) race spoiled by stewards’ decisions after the race had finished. The winner of any race is the first across the line. You are not the ‘winner’ when the chap who crossed the line before you is later given a 25 second time penalty. How do we stop this? Actually, it could be stopped quite easily. The drivers and the teams should refuse to acknowledge such decisions. In this case, Massa and Ferrari would refuse the post-event win and Hamilton remain the winner. However, this would require drivers and teams to take the high moral ground - and are they capable of this? Somehow I doubt it, personal ambition, greed and commercial considerations will overcome the frail hold we humans have on ethics. Back to the race at Spa. The only team that really was smiling at the end was Toro Rosso, with Vettel in 5th and Bourdais in 7th. That Vettel ended up in the points did not surprise me, but the ultimatum given to Bourdais had certainly lit the fire in the Frenchman’s belly. His best drive to date. But will it be enough for him to retain his seat in 2009? He will need more results like that to be given a contract. Piquet in the Renault ended up with another black mark in his report card. Unless his sponsors throw in another large bag of cash to Flav I do not expect to see him at Renault next year. The Sulky Spaniard just kept his nose clean, and deserved his 4th position. Who else impressed? Well, there was Trulli’s blinding start that had him up to sixth before he was clouted. And then at the end, Heidfeld’s do or die change to wets with two laps to go was an inspired call, even if his driving isn’t. Spa is a fabulous circuit and must be retained as a venue. There were many passing maneuvers, with Kovalainen doing the lion’s share until he was given a drive-through for a silly and clumsy attempt on Webber. I am now very worried that Singapore will be another Valencia. If it is, it will be another nail in F1’s coffin. Last week I mentioned that Raymond Sommer, Pierre Levegh and Briggs Cunningham all had something in common in the Le Mans 24 hour race. I asked what was it? All three of them drove for more than 20 of the 24 hours duration. Levegh blew up in 1952, one and a quarter hours from home, Sommer drove for 21 hours before handing over to his co-driver to win the race in 1932 and Briggs Cunningham drove for 20 hours before handing over in 1950 to come fourth. So to this week. When we pull up at the traffic lights, why should we remember Herbert Frood? It appears that Thailand is not the only country to shoot itself in the foot. Now India is going the same way. 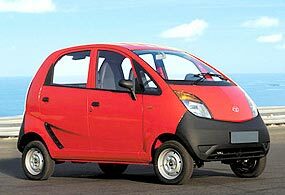 The launch of the world’s cheapest car, the Nano, has been delayed by angry farmers who claim local car maker Tata built its plant on their land. Tata Motors CEO Ratan Tata, a well known philanthropist, is furious at being embroiled in a nasty, bitter mess that he had nothing to do with. The disputed land was handed to Tata by a West Bengal government eager to attract investment to beat years of stagnation. Few Indian businessmen want to invest money in a Communist-ruled state where rigid and out-dated Leninist dogmas override other considerations. The angry farmers who are being led by a local politician Mamata Banerjee, who is looking for a populist issue to remain in the news, say they want 400 acres of disputed land at the site to be handed back to them. Ratan Tata said earlier this week that if people did not want the factory, he would happily move it to another part of India, despite having invested $350 million dollars in it. The class which would appear to have the brightest future in Asia is undoubtedly the Asian Touring Car Series (ATCS) 1500Max. Whilst the Porsche Carrera Cup Asia has been in existence for a few years now, it is a playground for the richer driver. The same can be said about the Formula BMW Asia, which although it is a great stepping stone for the young drivers out there, Daddy has to have deep pockets. At least $250,000 deep. The Asian Touring Car Series which has bigger cars, also needs bigger budgets. For example, local star Thomas Raldorf was offered a drive in the Engstler BMW at Bira, after regular driver Jack Lemvard went to Europe to continue in the ADAC series over there (where he blitzed the opposition and will continue in Europe for the next month). There was only one catch for Raldorf. They wanted 7,500 euros for the one-off drive. That’s about 375,000 baht for a weekend of fun. And in motorsport, that can be a weekend of frustration! In the lead-up to the weekend’s racing at our Bira International circuit, Thomas was invited to try out the works Proton Neo ATCS 1500Max, and I also scored an invitation to sample this new class and the Proton. Leading the Proton team is Alex Yoong, the only Malaysian to drive in F1 a couple of years back, and a thoroughly nice young man (in a sport that has more than its fair share of cons and desperados). With a series limit of 120 bhp at the wheels, the set-up of the car is very important, to be able to get that horsepower on the bitumen at all times. Assisting the team and its drivers is a very sophisticated data logging system which allows the team engineers to analyze exactly what the driver is doing at all times, and then compare the different drivers. In my case the engineer showed me that whilst I was driving on the ‘perfect’ line, I was applying the brakes 50 meters before their number 1 driver and I was slower to achieve full throttle after the corner. I just wish they had that sort of system when I was at my peak! 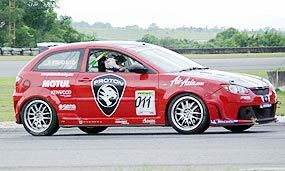 With seven manufacturers committed to the ATCS 1500Max for 2009, and sensible financial figures to produce a competitive race car, this series does represent a category to allow truly affordable ‘international’ racing for our Thai drivers. All that is necessary is for the RAAT to ratify the class and regulations. After driving the Proton 1500Max, I am convinced this is a step in the right direction. My thanks to Alex Yoong and the Proton Team for allowing me to experience ATCS 1500Max first hand.